The February Revolution (March 1917) was a revolution focused around Petrograd (now St. Petersburg). In the chaos, members of the Imperial parliament or Duma assumed control of the country, forming the Russian Provisional Government. 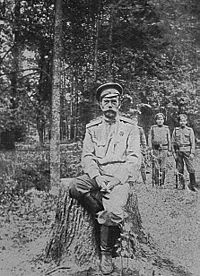 The army leadership felt they did not have the means to suppress the revolution and Tsar Nicholas II of Russia, the last Tsar of Russia, abdicated. The Soviets (workers' councils), which were led by more radical socialist factions, initially permitted the Provisional Government to rule, but insisted on a prerogative to influence the government and control various militias. The February Revolution took place in the context of heavy military setbacks during the First World War, which left much of the army in a state of mutiny. In the October Revolution (November in the Gregorian calendar), the Bolshevik party, led by Vladimir Lenin, and the workers' Soviets, overthrew the Provisional Government in St Petersburg. The Bolsheviks appointed themselves as leaders of various government ministries and seized control of the countryside, establishing the Cheka to quash dissent. To end the war, the Bolshevik leadership signed the Treaty of Brest-Litovsk with Germany in March 1918. Civil war erupted between the "Red" (Bolshevik), and "White" (anti-Bolshevik) factions, which was to continue for several years, with the Bolsheviks ultimately victorious. In this way the Revolution paved the way for the Union of Soviet Socialist Republics (USSR). While many notable historical events occurred in Moscow and St Petersburg, there was also a broad-based movement in cities throughout the state, among national minorities throughout the empire, and in the rural areas, where peasants took over and redistributed land. Picture - Bolshevik forces marching on Red Square. World War I prompted a Russian outcry directed at Tsar Nicholas II. It was another major factor contribution to the retaliation of the Russian Communists against their Royal counterparts. After the entry of Turkey on the side of the Central Powers in October 1914, Russia was deprived of a major trade route through Turkey, which followed with a minor economic crisis, in which Russia became incapable of providing munitions to their army in the years leading to 1917. However, the problems were merely administrative, and not industrial as Germany was producing great amounts of munitions whilst constantly fighting on two major battlefronts. The war also developed a weariness in the city, owing to a lack of food in response to the disruption of agriculture. Food had become a considerable problem in Russia, but the cause of this did not lie in any failure of the harvests, which had not been significantly altered during war-time. The indirect reason was that the government, in order to finance the war, had been printing off millions of rouble notes, and by 1917 inflation had sent prices up to four times what they had been in 1914. The peasantry were consequently faced with the higher cost of purchases, but made no corresponding gain in the sale of their own produce, since this was largely taken by the middlemen on whom they depended. As a result they tended to hoard their grain and to revert to subsistence farming. Thus the cities were constantly short of food; at the same time rising prices led to demands for higher wages in the factories, and in January and February 1916 revolutionary propaganda, aided by German funds, lead to widespread strikes. The outcome of all this, however, was a growing criticism of the government rather than any war-weariness. The original fever of the patriotic excitement, which had caused the name of St. Petersburg to be changed to the less German sounding Petrograd, may have subsided a little in the subsequent years, but it had not turned to defeatism and during the initial risings in Petrograd in February 1917, the crowds in the streets clearly objected to the banners proclaiming "down with the war". Heavy losses during the war also strengthened thought that Tsar Nicholas II was unfit to rule. The Liberals were now better placed to voice their complaints, since they were participating more fully through a variety of voluntary organizations. Local industrial committees proliferated and in July 1915 a Central War Industries Committee, established under the chairmanship of a prominent Octobrist Guchkov, included ten workers' representatives- in which the Petrograd Mensheviks agreed to join despite the objections of their leaders abroad. All this activity gave renewed encouragement to political ambitions and in September 1915 a combination of Octobrists and Kadets in the Duma demanded the forming of a responsible government. The Tsar rejected these proposals. He had now taken over the position of commander-in-chief of the armed forces and during his absence at his headquarters at Mogilev, he had left most of the day-to-day government in the hands of the Empress who was intensely unpopular, owing to her German origin and the influence that Rasputin, an unsavoury monk, was thought to exercise over her. All these factors had given rise to a sharp loss of confidence in the regime by 1916. Early in that year, Guchkov had been taking soundings among senior army officers and members of the Central War Industries Committee about a possible coup to force the abdication of the Tsar. In November Pavel Milyukov in the Duma openly accused the government of contemplating peace negotiations with Germany. In December, a small group of nobles assassinated Rasputin and in January 1917 the Tsar's uncle, Grand Duke Nicholas, was asked indirectly by Prince Lvov whether he would be prepared to take over the throne from his nephew, Tsar Nicholas II. None of these incidents were in themselves the immediate cause of the February revolution, but they do help to explain why the monarchy survived only a few days after it had broken out. Meanwhile, the Social Democrat leaders in exile, now mostly in Switzerland, had been the glum spectators of the collapse of International Socialist solidarity. French and German Social Democrats had voted in favour of their respective governments. Plekhanov in Paris had adopted a violently anti-German stand, while Helphand supported the German war effort as the best means of ensuring a revolution in Russia. The Mensheviks largely maintained that Russia had the right to defend herself against Germany, although Martov (a prominent Menshevik), now on the left of his group, demanded an end to the war and a settlement on the basis of national self-determination, with no annexations or indemnities. It was these views of Martov that predominated in a manifesto drawn up by Leon Trotsky (a major Bolshevik revolutionary) at a conference in Zimmerwald, attended by thirty-five Socialist leaders in September 1915. Inevitably Lenin, supported by Zinoviev and Radek, strongly contested them. Their attitudes became known as the Zimmerwald Left. Lenin rejected both the defence of Russia and the cry for peace. Since the autumn of 1914 he had insisted that "from the standpoint of the working class and of the labouring masses from the lesser evil would be the defeat of the Tsarist Monarchy"; the war must be turned into a civil war of the proletarian soldiers against their own governments, and if a proletarian victory should emerge from this in Russia, then their duty would be to wage a revolutionary war for the liberation of the masses throughout Europe. Thus Lenin remained the enfant terrible of the Russian Social Democratic Labour Party, although in this point in the war his following in Russia was as little as 10 000 and he must have seemed no more than the leader of an extremist wing of a bankrupt organization. 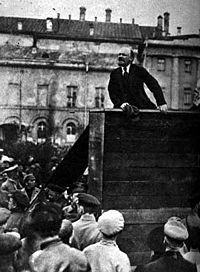 Lenin, however, then executed the protests of Petrograd which set off the 1917 Russian Revolution. Workers also had good reasons for discontent: overcrowded housing with often deplorable sanitary conditions, long hours at work (on the eve of the war a 10-hour workday six days a week was the average and many were working 11-12 hours a day by 1916), constant risk of injury and death from very poor safety and sanitary conditions, harsh discipline (not only rules and fines, but foremen’s fists), and inadequate wages (made worse after 1914 by steep war-time increases in the cost of living). At the same time, urban industrial life was full of benefits, though these could be just as dangerous, from the point of view of social and political stability, as the hardships. There were many encouragements to expect more from life. Acquiring new skills gave many workers a sense of self-respect and confidence, heightening expectations and desires. Living in cities, workers encountered material goods such as they had never seen while in the village. Most important, living in cities, they were exposed to new ideas about the social and political order. The rapid industrialization of Russia also resulted in urban overcrowding and poor conditions for urban industrial workers (as mentioned above). Between 1890 and 1910, the population of the capital, Saint Petersburg, swelled from 1,033,600 to 1,905,600, with Moscow experiencing similar growth. This created a new 'proletariat' which, due to being crowded together in the cities, was much more likely to protest and go on strike than the peasantry had been in previous times. In one 1904 survey, it was found that an average of sixteen people shared each apartment in Saint Petersburg, with six people per room. There was also no running water, and piles of human waste were a threat to the health of the workers. The poor conditions only aggravated the situation, with the number of strikes and incidents of public disorder rapidly increasing in the years shortly before World War I. Because of late industrialization, Russia's workers were highly concentrated. By 1914 40% of Russian workers were employed in factories of +1,000 workers (32% in 1901). 42% worked in 100-1,000 worker enterprises, 18% in 1-100 worker businesses (in the USA, 1914, the figures were 18, 47 and 35 respectively). Many sections of the crown had reason to be dissatisfied with the existing autocracy. Nicholas II was a deeply conservative ruler and maintained a strict authoritarian system. Individuals and society in general were expected to show self-restraint, devotion to community, deference to the social hierarchy, and a sense of duty to country. Religious faith helped bind all of these tenets together as a source of comfort and reassurance in the face of difficult conditions and as a means of political authority exercised through the clergy. Perhaps more than any other modern monarch, Nicholas II attached his fate and the future of his dynasty to the notion of the ruler as a saintly and infallible father to his people. This idealized vision of the Romanov monarchy blinded him to the actual state of his country. With a firm belief that his power to rule was granted by Divine Right, Nicholas assumed that the Russian people were devoted to him with unquestioning loyalty. This ironclad belief rendered Nicholas unwilling to allow the progressive reforms that might have alleviated the suffering of the Russian people. Even after the 1905 revolution spurred the Tsar to decree limited civil rights and democratic representation, he worked to limit even these liberties in order to preserve the ultimate authority of the crown. Despite constant oppression, the desire of the people for democratic participation in government was strong. Since the Age of Enlightenment, Russian intellectuals had promoted Enlightenment ideals such as the dignity of the individual and of the rectitude of democratic representation. These ideals were championed most vociferously by Russia’s liberals, although populists, Marxists, and anarchists also claimed to support democratic reforms. A growing opposition movement had begun to challenge the Romanov monarchy openly well before the turmoil of World War I. In 1915, things took a critical turn for the worse when Germany shifted its focus of attack to the Eastern front. The superior German army-better led, better trained and better supplied-was terrifyingly effective against the ill-equipped Russian forces, driving the Russians out of Galicia, as well as Russian Poland, during the Gorlice-Tarnx�w Offensive campaign. 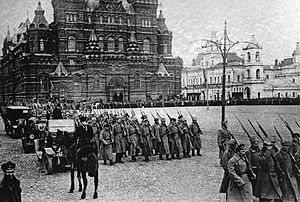 By the end of October 1916, Russia had lost between 1,600,000 and 1,800,000 soldiers, with an additional 2,000,000 prisoners of war and 1,000,000 missing, all making up a total of nearly 5,000,000 men. Casualty rates were the most vivid sign of this disaster. Already, by the end of 1914, only five months into the war, around 390,000 Russian men had lost their lives and nearly 1,000,000 were injured. Far sooner than expected, scarcely trained recruits had to be called up for active duty, a process repeated throughout the war as staggering losses continued to mount. The officer class also saw remarkable turnover, especially within the lower echelons, which were quickly filled with soldiers rising up through the ranks. These men, usually of peasant or worker backgrounds, were to play a large role in the politicization of the troops in 1917. The war devastated not only soldiers. By the end of 1915, there were manifold signs that the economy was breaking down under the heightened strain of wartime demand. The main problems were food shortages and rising prices. Inflation shoved real incomes down at an alarmingly rapid rate, and shortages made it difficult to buy even what one could afford. These shortages were especially a problem in the capital, St. Petersburg, where distance from supplies and poor transportation networks made matters particularly bad. Shops closed early or entirely for lack of bread, sugar, meat and other provisions, and lines lengthened massively for what remained. It became increasingly difficult both to afford and actually buy food. Not surprisingly, strikes increased steadily from the middle of 1915, and so did crime; but, for the most part, people suffered and endured, scouring the city for food. Working-class women in St. Petersburg reportedly spent about forty hours a week in food lines, begging, turning to prostitution or crime, tearing down wooden fences to keep stoves heated for warmth, grumbling about the rich, and wondering when and how this would all come to an end. Government officials responsible for public order worried about how long the people's patience would last. A report by the St. Petersburg branch of the security police, the Okhrana, in October 1916, warned bluntly of "the possibility in the near future of riots by the lower classes of the empire enraged by the burdens of daily existence." Picture - Nicholas II, March 1917, shortly after the revolution brought about his abdication. At the beginning of February, Petrograd workers began several strikes and demonstrations. On March 7 [O.S. February 22], workers at Putilov, Petrograd's largest industrial plant, announced a strike. The next day, a series of meetings and rallies were held for International Women's Day, which gradually turned into economic and political gatherings. Demonstrations were organised to demand bread, and these were supported by the industrial working force who considered them a reason for continuing the strikes. The women workers marched to nearby factories bringing out over 50,000 workers on strike. By March 10 [O.S. February 25], virtually every industrial enterprise in Petrograd had been shut down, together with many commercial and service enterprises. Students, white-collar workers and teachers joined the workers in the streets and at public meetings. To quell the riots, the Tsar looked to the army. At least 180,000 troops were available in the capital, but most were either untrained or injured. Historian Ian Beckett suggests around 12,000 could be regarded as reliable, but even these proved reluctant to move in on the crowd, since it included so many women. It was for this reason that when, on March 11 [O.S. February 26], the Tsar ordered the army to suppress the rioting by force, troops began to mutiny. Although few actively joined the rioting, many officers were either shot or went into hiding; the ability of the garrison to hold back the protests was all but nullified, symbols of the Tsarist were rapidly torn down around the city, and governmental authority in the capital collapsed - not helped by the fact that Nicholas had prorogued the Duma that morning, leaving it with no legal authority to act. The response of the Duma, urged on by the liberal bloc, was to establish a Temporary Committee to restore law and order; meanwhile, the socialist parties establish the Petrograd Soviet to represent workers and soldiers. The remaining loyal units switched allegiance the next day. The Tsar took a train back towards Petrograd, which was stopped on March 14 [O.S. March 1], having been instructed to divert by a group of disloyal troops. When the Tsar finally reached his destination, the Army Chiefs and his remaining ministers (those who had not fled under pretense of a power-cut) suggested in unison that he abdicate the throne. He did so on March 15 [O.S. March 2], on behalf of himself, and then, having taken advice, on behalf of his son, the Tsarevich. Nicholas nominated his brother, the Grand Duke Michael Alexandrovich, to succeed him. But the Grand Duke realised that he would have little support as ruler, so he declined the crown on March 16 [O.S. March 3], stating that he would take it only if that was the consensus of democratic action. Six days later, Nicholas, no longer Tsar and addressed with contempt by the sentries as "Nicholas Romanov", was reunited with his family at the Alexander Palace at Tsarskoe Selo. He was placed under house arrest with his family by the Provisional Government. The effective power of the Provisional Government was challenged by the authority of an institution that claimed to represent the will of workers and soldiers and could, in fact, mobilize and control these groups during the early months of the revolution-the Petrograd Soviet [Council] of Workers' Deputies. The model for the soviet were workers' councils that had been established in scores of Russian cities during the 1905 revolution. In February 1917, striking workers elected deputies to represent them and socialist activists began organizing a citywide council to unite these deputies with representatives of the socialist parties. On 27 February, socialist Duma deputies, mainly Mensheviks and Socialist Revolutionaries, took the lead in organizing a citywide council. The Petrograd Soviet met in the Tauride Palace, the same building where the new government was taking shape. The political group that proved most troublesome for Kerensky, and would eventually overthrow him, was the Bolshevik Party, led by Vladimir Lenin. Lenin had been living in exile in neutral Switzerland and, due to democratization of politics after the February Revolution, which legalized formerly banned political parties, he perceived the opportunity for his Marxist revolution. Although return to Russia had become a possibility, the war made it logistically difficult. Eventually, German officials arranged for Lenin to pass through their territory, hoping that his activities would weaken Russia or even-if the Bolsheviks came to power-lead to Russia's withdrawal from the war. Lenin and his associates, however, had to agree to travel to Russia in a sealed train: Germany would not take the chance that he would foment revolution in Germany. After passing through the front, he arrived in Petrograd in April 1917. On 18 June, the Provisional Government launched an attack against Germany that failed miserably. Soon after, the government ordered soldiers to go to the front, reneging on a promise. The soldiers refused to follow the new orders. The arrival of radical Kronstadt sailors-who had tried and executed many officers, including one admiral-further fueled the growing revolutionary atmosphere. 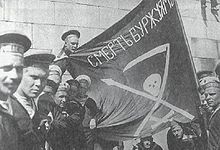 The sailors and soldiers, along with Petrograd workers, took to the streets in violent protest, calling for "all power to the Soviets." The revolt, however, was disowned by Lenin and the Bolshevik leaders and dissipated within a few days. In the aftermath, Lenin fled to Finland under threat of arrest while Trotsky, among other prominent Bolsheviks, was arrested. The July Days confirmed the popularity of the anti-war, radical Bolsheviks, but their unpreparedness at the moment of revolt was an embarrassing gaffe that lost them support among their main constituent groups: soldiers and workers. In early September, the Petrograd Soviet freed all jailed Bolsheviks and Trotsky became chairman of the Petrograd Soviet. Growing numbers of socialists and lower-class Russians viewed the government less and less as a force in support of their needs and interests. The Bolsheviks benefited as the only major organized opposition party that had refused to compromise with the Provisional Government, and they benefited from growing frustration and even disgust with other parties, such as the Mensheviks and SRs, who stubbornly refused to break with the idea of national unity across all classes. Picture - Vladimir Lenin leader of the Bolsheviks. The October Revolution was led by Vladimir Lenin and was based upon Lenin's writing on the ideas of Karl Marx, a political ideology often known as Marxism-Leninism. It marked the beginning of the spread of communism in the twentieth century. It was far less sporadic than the revolution of February and came about as the result of deliberate planning and coordinated activity to that end. Though Lenin was the leader of the Bolshevik Party, it has been argued that since Lenin was not present during the actual takeover of the Winter Palace, it was really Trotsky's organization and direction that led the bloody revolution, spurred by the motivation Lenin instigated within his party. Critics on the Right have long argued that the financial and logistical assistance of German intelligence via their key agent, Alexander Parvus was a key component as well, though historians are divided, for the evidence is sparse. Soviet membership was initially freely elected, but many members of the Socialist-Revolutionary Party, anarchists, and other leftists opposed the Bolsheviks through the soviets. When it became clear that the Bolsheviks had little support outside of the industrialized areas of Saint Petersburg and Moscow, they barred non-Bolsheviks from membership in the soviets. Other socialists revolted and called for "a third Russian revolution." The most notable instances were the Tambov rebellion, 1919-1921, and the Kronstadt rebellion in March 1921. These movements, which made a wide range of demands and lacked effective coordination, were eventually defeated along with the White Army during the Civil War. The Russian Civil War, which broke out in 1918 shortly after the revolution, brought death and suffering to millions of people regardless of their political orientation. The war was fought mainly between the Red Army ("Reds"), consisting of the uprising majority, and the "Whites"-the monarchists, conservatives, liberals and moderate socialists who opposed the drastic restructuring championed by the Bolsheviks. The Whites had backing from nations such as Great Britain, France, USA and Japan. In early March, the Provisional Government placed Nicholas and his family under house arrest in the Alexander Palace at Tsarskoe Selo, 15 miles (24 km) south of Petrograd. In August 1917 the Kerensky government evacuated the Romanovs to Tobolsk in the Urals, allegedly to protect them from the rising tide of revolution during the Red Terror. After the Bolsheviks came to power in October 1917, the conditions of their imprisonment grew stricter and talk of putting Nicholas on trial increased. As the counter revolutionary White movement gathered force, leading to full-scale civil war by the summer, the Romanovs were moved during April and May 1918 to Yekaterinburg, a militant Bolshevik stronghold. During the early morning of 16 July, at approximately 01:30, Nicholas, Alexandra, their children, their physician, and several servants were taken into the basement and killed. According to Edvard Radzinsky and Dmitrii Volkogonov, the order came directly from Vladimir Lenin and Yakov Sverdlov in Moscow. That the order came from the top has long been believed, although there is a lack of hard evidence. It has been argued that the execution was carried out on the initiative of local Bolshevik officials, or that it was an option approved in Moscow should White troops approach Yekaterinburg. Radzinsky noted that Lenin's bodyguard personally delivered the telegram ordering the execution and that he was ordered to destroy the evidence. Leon Trotsky said that the goal of socialism in Russia would not be realized without the success of the world revolution. Indeed, a revolutionary wave caused by the Russian Revolution lasted until 1923. Despite initial hopes for success in the German Revolution, in the short-lived Hungarian Soviet Republic and others like it, no other Marxist movement succeeded in keeping power in its hands. The confusion regarding Stalin's position on the issue stems from the fact that he, after Lenin's death in 1924, successfully used Lenin's argument-the argument that socialism's success needs the workers of other countries in order to happen-to defeat his competitors within the party by accusing them of betraying Lenin and, therefore, the ideals of the October Revolution. August-November: Russia suffers heavy defeats and a large shortage of supplies, including food and munitions, but holds onto Austrian Galicia. 18 August: St. Petersburg is renamed Petrograd as 'Germanic' names are changed to sound more Russian, and hence more patriotic. 5 June: Strikers shot at in Kostromx�; casualties. 10 August: Strikers shot at in Ivx�novo-Voznes�nsk; casualties. 17 August-19th: Strikers in Petrograd protest at the deaths in Ivx�novo-Voznes�nsk. January-December: Despite successes in the Brusilov offensive, the Russian war effort is still characterised by shortages, poor command, death and desertion. Away from the front, the conflict causes starvation, inflation and a torrent of refugees. Both soldiers and civilians blame the incompetence of the Tsar and his government. 29 February: After a month of strikes at the Putx�lov Factory, the government conscripts the workers and takes charge of production. Protest strikes follow. Acton, Edward, Vladimir Cherniaev, and William G. Rosenberg, eds. A Critical Companion to the Russian Revolution, 1914-1921 (Bloomington, 1997). Cambridge History of Russia, vol. 2-3, England: Cambridge University Press. ISBN 0-521-81529-0 (vol. 2) ISBN 0-521-81144-9 (vol. 3). Lincoln, W. Bruce. Passage Through Armageddon: The Russians in War and Revolution, 1914-1918. (New York, 1986). Wade, Rex A. (2005). The Russian Revolution, 1917. Cambridge University Press. ISBN 9780521841559. http://books.google.com/books?id=uBfnjdxFUkUC. Retrieved 1 September 2010. Serge, Victor. Year One of the Russian Revolution. L'An l de la revolution russe, 1930. Year One of the Russian Revolution, Holt, Reinhart, and Winston. Translation, editor's Introduction, and notes � 1972 by Peter Sedgwick. Reprinted on Victor Serge Internet Archive by permission. ISBN 0-86316-150-2. Retrieved 14 May 2005. Bunyan, James and H. H. Fisher, eds. The Bolshevik Revolution, 1917-1918: Documents and Materials (Stanford, 1961; first ed. 1934).